I love three-day weekends. For one, it means a four-day work week! Not that I dislike working but it is nice to take a break from work. We live by a schedule whether it’s a three-day weekend, through the week or a regular weekend. Medications, lunch, laundry, shower, shaving, more medications, more laundry and more shaving. Throw in the dogs’ schedule: eating, playtime, sleeping, playtime, eating, playtime and sleeping. It may seem like chaos to the outside observer but we know the schedule and know what works for us. I schedule Robert’s haircuts after lunch and before mid-afternoon medication time. Our dinners out are scheduled early so Robert has enough time to enjoy a dinner out yet get ready for bed before his 9:00 p.m. final dose of medication for the day. It is very, very rare that Robert is in bed after 9:00 p.m. A solid routine and lots of sleep means fewer seizures (usually). So there were all kinds of reasons NOT to see a movie on Sunday, Day Two of a three-day weekend. I was getting stir-crazy being in the house all weekend and thought Robert and hubby would have fun going out too. But what to do? Being spontaneous in our household means thinking of something to do at noon and then putting it into action several hours later. Driving to the beach was out. It is too long of a drive for us with Richard’s back pain. We have to stop and let him stretch several times during a drive and a two and a half hour trip to the ocean turns into five. (And that’s one way.) Plus, we haven’t taken Robert to the beach yet and I don’t know how that would work (I mean, seriously, how easy is it to go the bathroom at the beach?). It is not something to figure out in an afternoon. What about a movie? I checked what was playing and the only movie that sounded like something we would all enjoy was “Now You See Me.” It was showing at one theater that I haven’t been to before and started at 4:45 p.m.
Ugh! This was a terrible time. This was fifteen minutes before Robert’s medication time not to mention his regular dinner time; smack dab in the middle of the dogs’ dinner and playtime and, since the movie was longer than I would have liked, we would get home later than I would prefer in order to allow Robert time to be in bed by 9:00. Plus, this movie was showing at a theater I had not been to and I didn’t know the bathroom lay-out. The bathroom situation is one I always consider no matter where we go. An emergency clean-up could strike at any time – do they have family-style bathrooms or will Richard have to take Robert in to the bathroom and do the clean-up duties? It is a serious consideration. We knew the walk to the theater from the parking lot would be too much for Robert so we have to bring the wheelchair. Will there be space for the wheelchair and Richard and I to sit together? I have been to theaters where there is one spot for the wheelchair and only one chair next to that space. Other seats are in the row in front of those two spots – whoever designed those spots obviously didn’t anticipate more than one person going to the movies with the person in the wheelchair! Even though there were plenty of reasons not to go to this movie, we went anyway. Robert got ready to go – went to the bathroom and shaved and Richard loaded the wheelchair and fed the dogs. I prepped Robert’s medications so he could take them before the movie started. We got to the theater in plenty of time and were surprised to find this was a cheap movie theater! We paid $4 per ticket! What?! Since we were in the middle of dinner time, I told Robert we would get him a hot dog along with popcorn and Sprite. Heck, let's splurge! I just saved a bunch on the tickets! I scoped out the bathrooms and they weren’t family-style but they were at least close to the theater we were entering. It would be an easy maneuver to take Robert in if needed. Richard wheeled Robert into the theater while Robert held what seemed like a gallon-size cup of Sprite (and that was the “small”) and Richard held the gallon-size tub of popcorn (at least that was called a large). I waited for the hot dog (not sure what they were doing with it but don’t really want to know) and caught up with them as they entered the theater. The wheelchair area was at the end of a row in the back of the theater. Woohoo! Richard and I can sit together and – bonus – Richard has a place to stand when he needs to stretch his aching back. We set Robert up with his food and drink (we could have used one more cup holder but that wasn’t a huge deal). 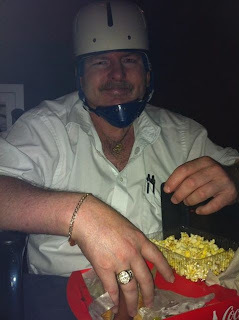 I gave Robert his meds before the previews started and he enjoyed some popcorn and his hot dog. He ate more popcorn during the movie and would have eaten more if I had let him. Instead, he made sure to eat every last popcorn crumb in the tray I had given him. The movie is not going to win any awards but it was definitely entertaining. It was less predictable than I expected which was a pleasant surprise and the actors were all likable (although I couldn’t get Mark Zuckerberg out of my head since Jesse Eisenberg was in this movie and he starred in “The Social Network”). The movie had magic tricks which Robert enjoys as well as a cat and mouse game involving Morgan Freeman and Mark Ruffalo (two actors I adore!) and lots of action. The movie is rated PG-13 so there weren’t a lot of disturbing violent scenes although there was someone having a very bad day which involved getting tangled up in a garbage disposal. There wasn’t anything graphic but just the thought of what could happen! Yikes! I peeked over at Robert throughout the show and only once or twice was he dosing off (probably because he was in a junk-food coma). Once the movie ended and we were on our way out to the car, we asked Robert what he thought of the movie. “I loved it” was his reply. There were lots of reasons we could have stayed home instead of venturing out but these were the best reasons to have gone. We even got home in enough time for Robert to finish his bedtime routine with a few minutes to spare before 9:00 p.m.! I would give this movie three (out of five) scoops of Rocky Road Ice Cream but will have to add a half scoop since Robert had such a great time. 3 ½ scoops for Now You See Me!